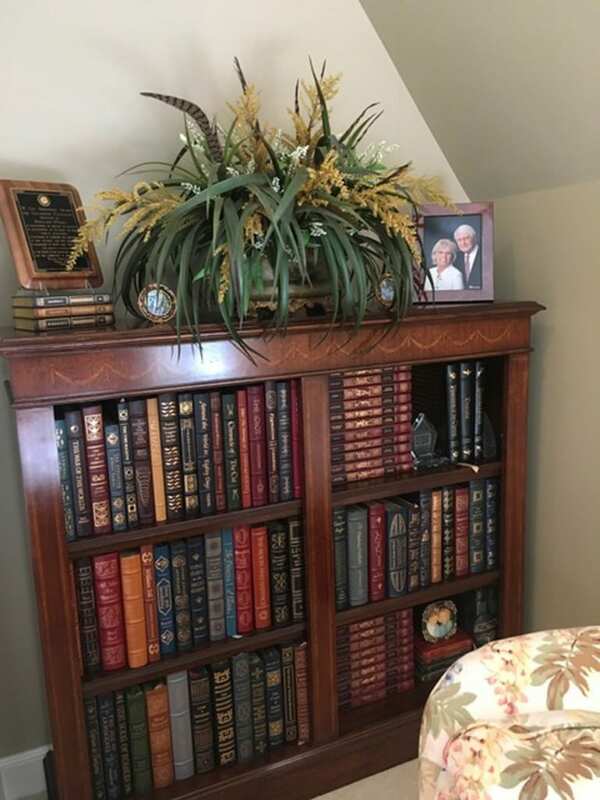 Our customers Ken and Bettyann in Nantick, MA, sent us some great photos of the Scarborough House bookcases they bought from us. The bookcases were custom-produced so they took some time to be made. Then came the day that the bookcases were delivered to Ken and Bettyann. Here they are in place, flanking the chimney breast. 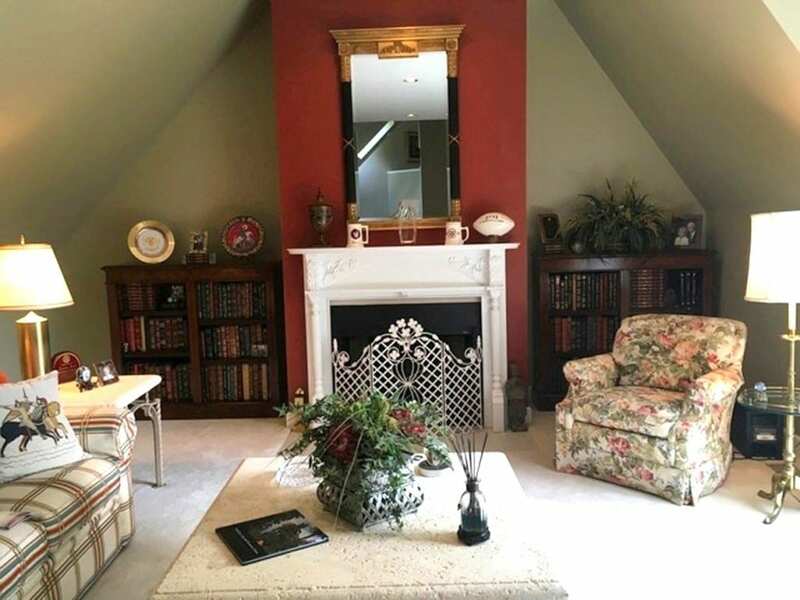 Ken and Bettyann ordered this pair of Scarborough House bookcases as they were just the right dimensions to fit into the two nooks on either side of the fireplace. The fireplace mantel and screen are beautiful. What a warm and inviting space to curl up with a good book! I love how Bettyann has coordinated the colors of the book jackets with her accessories! The warm red and gold tones look wonderful and the bookcases look perfectly at home. Scarborough House Fine Furniture makes gorgeous antique-inspired furniture for every room, using traditional furniture techniques and with lovely hand-crafted details and exquisite veneers. An Englishman founded the company and as a fine furniture maker and designer he has very high standards that can be seen in his pieces. Scarborough House furniture is often very decorative, especially in the pieces that are interpretations of European antique furniture. Hand-crafted details including intricate marquetry inlay and the classic appeal of Scarborough House furniture is perfect for a traditional home. We love seeing these custom-made bookcases in Ken and Bettyann’s home and we are sure they will become heirloom pieces! 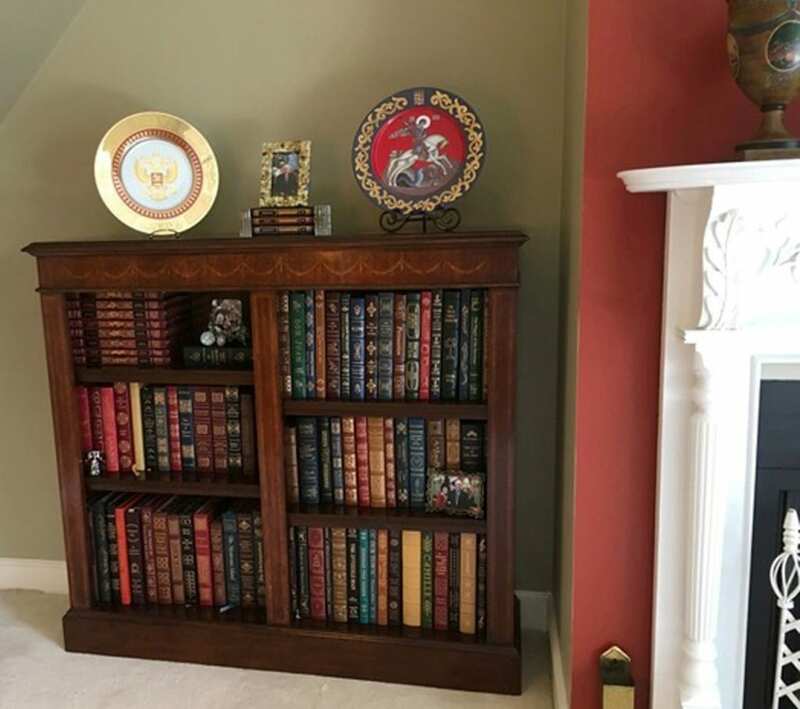 This entry was posted in Client Spotlight and tagged bookcase, bookshelf, expert craftsmanship, red interior, Scarborough House, traditional home on July 18, 2018 by admin. Part of what I love about living with antiques is the innate sense of history each piece embodies. And nowhere is this more evident than with antique or vintage French Country kitchen furniture. When I sit down at my antique kitchen table, I can almost feel the original owners gathered around, the entire family enjoying a bowl of the classic French pot au feu. Who knows how many generations ate this hearty stew and drank wine together at this very table? I love France, and my antique dining table connects me with those wonderful people on a soulful level. So I was delighted to discover a trio of new books from Robert Rose publishing that will help you enjoy your antique furnishings during this holiday season. Two are cookbooks and one teaches you how to create elegant napkin folds — perfect for any occasion, and particularly appropriate for those planning a Victorian Christmas. Let’s dive right in! This delightful book by Denise Vivaldo takes you through all kinds of fun and pretty napkin folds with skill levels that range from easy to challenging. Vivaldo has catered everything from the Academy Awards Governor’s Ball to Hollywood wrap parties, so she knows her stuff. The book is helpfully wire-bound so you can set it flat right next to you as you walk through the steps to create each napkin fold. Napkin folding is kind of a lost art, yet it will make your family members and friends feel very special to sit down at a place setting that includes a folded napkin. And your holiday dinners will feel even fancier with the simple touch of a folded napkin. In the book, Vivaldo also discusses how to choose the right napkins for any occasion, what to look for in terms of fabric (to make folding work better), and what size napkin to use for various occasions (think: cocktail napkins, luncheon napkins, dinner napkins, and even paper napkins). This is a book that will reside on your bookshelf for years to come, as you discover the fun of napkin folding. Do you sometimes feel overwhelmed by the volume of cooking involved in the holidays? I know I do. So, I was pleased to discover this book of delicious (and simple!) grilled cheese sandwiches. Written by Alison Lewis, a nationally known recipe developer, 150 Best Grilled Cheese Sandwiches includes selections that range from humble to decadent. If you picture the grilled cheese sandwich of your childhood and can’t stomach even the thought of the calorie load, you’ll be happy to learn Lewis’s book includes tips on how to lighten-up a grilled cheese sandwich (hint: use grainy mustards and Greek yogurt) and devotes an entire chapter to light and healthy sandwiches. Grilled cheese sandwiches are enjoying a huge resurgence and were recently named a major trend in cooking. These sandwiches can be fun to prepare with guests, and you can even create dessert sandwiches! One of our favorites to help us get out of the holiday turkey rut is this decadent-looking Grilled Roast Beef and Stilton sandwich. You’ll need: a panini grill or large skillet. Preheat panini grill to medium, if using. Brush one side of each bread slice with butter. Place on a work surface, buttered side down. Spread 4 bread slices equally with mayonnaise. Top equally with roast beef, arugula, tomatoes and cheese. Cover with remaining bread slices, buttered side up, and press together gently. Place sandwiches on preheated panini grill or in a large skillet over medium heat and cook, turning once if using a skillet, for 3 to 4 minutes or until golden brown and cheese is melted. Serve immediately. Getting back to that pot au feu I mentioned earlier… With their classic beef stew, the French knew this truism: A good soup nourishes the heart as well as the stomach. This fabulous soup cookbook by Carla Snyder and Meredith Deeds will keep your family warm all winter. When you share the sublime soup recipes in this book, you’ll connect with friends and family members on an intimate level. Vegetarians and vegans will be happy to know the book contains plenty of meat-free selections. There’s even a classic pot au feu recipe! But I loved this decadent lobster chowder recipe because I think it would make a beautiful first course for any holiday dinner. Preheat oven to 425F. You’ll also need a large rimmed baking sheet. On a baking sheet, combine corn, oil, 1/2 tsp of the salt and 1/4 tsp of the black pepper; toss to coast evenly and spread in a single layer. Roast in preheated oven for 10 minutes. Stir and redistribute into an even layer. Roast until corn is lightly but evenly browned, 10 to 15 minutes. Remove from oven and set aside. In a large pot, saute bacon over medium heat until browned and crispy, about 5 minutes. Remove with a slotted spoon to a plate lined with paper towels. Set aside. Pour off all but 2 tbsp of the fat in the pot. Add onions and saute until lightly browned, about 10 minutes. Add cayenne and saute for 1 minute. Add potatoes, stock, clam juice, and the remaining salt and pepper; bring to a boil. Reduce heat and simmer for 15 minutes. Stir in roasted corn and cream; return to a simmer, stirring often, until potatoes are tender, about 5 minutes. Do not let boil. In a large, heavy skillet, melt butter over medium heat. Add lobster meat and saute until heated through, about 1 minute. Ladle chowder into heated bowls and top with lobster. Garnish with reserved bacon and chives. What elegant, decadent, or surprising dishes do you make during the holidays? Do you salute your ethnicity through food? Please share with us in the comments! Delivered by FeedBurner. We respect your email privacy. This entry was posted in Bookshelf and tagged books, bookshelf, Christmas, cookbooks, folded napkins, France, French dining, French recipes, grilled cheese, holiday, holiday cooking, napkin folding, napkins, pot au feu, recipes, soup recipes, Victorian on December 13, 2012 by euroluxantiques.